Last month, policemen in Naxal-infested Gadchiroli carried out a dramatic exercise to show that they were serious about enforcing the Maharashtra government's ban on gutkha or flavoured tobacco. They seized gutkha sachets worth Rs 30,000 from the market, piled them up in the main square and set the lot on fire. States have declared war on gutkha. Starting April 1, eight have banned the manufacture, sale and storage of this mixture of tobacco, catechu, areca nut, slaked lime and food additives: Madhya Pradesh took the lead; Kerala, Bihar, Maharashtra, Rajasthan, Jharkhand, Chhattisgarh and Haryana followed. 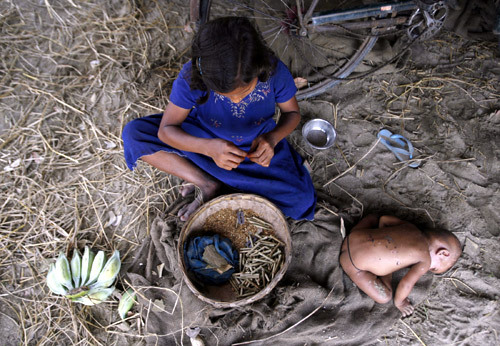 Image: Ten-year-old labourer Toslima Khatun makes bidis (shredded tobacco hand-rolled in tendu leaves) as her seven-month-old sister Hasnuhana rests in Bhulki village. Three days ago, in his Independence Day speech, Narendra Modi announced that gutkha will be banned in Gujarat from September 11 to "save the youths of Gujarat from the dreaded evil of cancer." Himachal Pradesh has also announced a ban but deferred it till October. And Uttar Pradesh has upped the value-added tax on gutkha from 12.5 per cent to 50 per cent. Some villages in Uttar Pradesh have banned the sale of gutkha. In India, 206 million people, including women and children as young as 13, use smokeless forms of tobacco which are known to cause cancer. 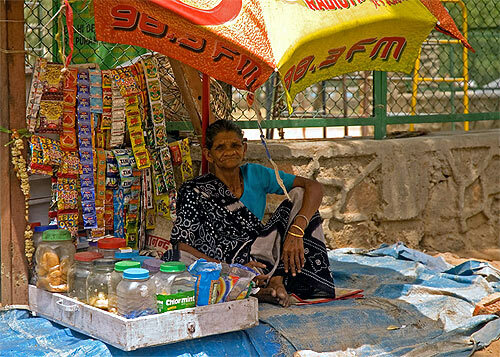 The gutkha market could be between Rs 15,000 crore and Rs 20,000 crore in annual sales. Sachets are sold through paan shops where you can find hundreds of brands; it clearly takes little to get started in gutkha. In the North-East, gutkha factories have been found to operate out of trucks. They could scoot at the sight of an excise inspector. And the gutkha lobby is strong and moneyed - so much money that the underworld got involved. 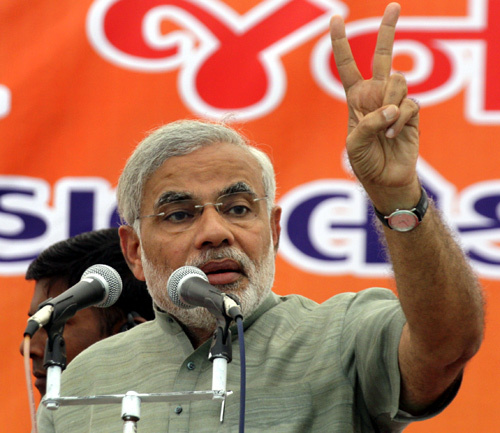 Image: Gujarat's Chief Minister Narendra Modi gestures during an election campaign rally in Balasinor. Cashing in on the rivalry between two gutkha tycoons, Dawood Ibrahim's brother, Anees, started the popular Fire brand of gutkha in Pakistan, says S Hussain Zaidi in his recent book Dongri to Dubai. 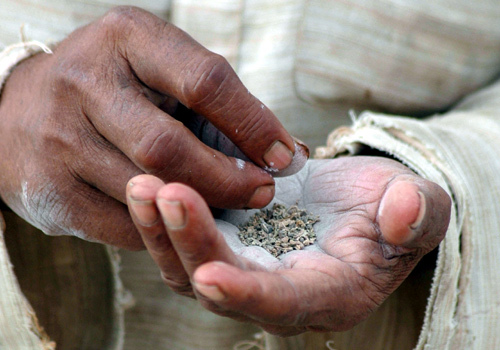 For years, the gutkha makers have resisted crackdown. But now the wheels appear to be suddenly spinning against them at dizzying speed. A group of people, inside and outside the government, as well as some organisations have been working hard to bring this powerful industry to its knees. Among them are Pankaj Chaturvedi, head and neck cancer surgeon at Tata Memorial Hospital in Mumbai, Ashwini Kumar Rai, former food safety commissioner of Madhya Pradesh, Keshav Desiraju, special secretary of health in the Union ministry of health and family welfare, Amal Pushp, director of the National Tobacco Control Programme, Voluntary Health Association of India (VHAI), a non-profit society, and Public Health Foundation of India (PHFI), a public-private initiative. 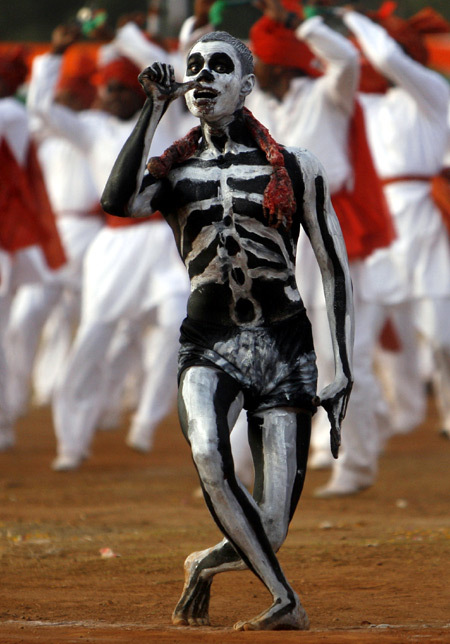 Image: A man with a skeletal design painted on him gestures to show the ill effects of smoking and drinking. The foundation stone for the battle was laid in 2004 when the Supreme Court, while hearing the Ghodawat Paan Masala case, ruled that "since paan masala, gutkha and supari are eaten for taste and nourishment, they all come under the category of food". Until then, those in the business had always succeeded in challenging bans on the ground that gutkha is not a food item. The ruling had come in a case filed by gutkha manufacturers after the Maharashtra administration enforced a ban. The apex court, however, struck that ban down and said that only the Central government had the power to ban a food item. The Centre did nothing of that sort. The battle seemed lost. But hope soared again when, while hearing another case, the Supreme Court asked the ministry of health to study the impact of gutkha on health and submit a report. This case, filed by the Jaipur-based Indian Asthma Care Society, also led to a ban on the sale of tobacco, gutkha and paan masala in plastic pouches - an environmentally hazardous business. 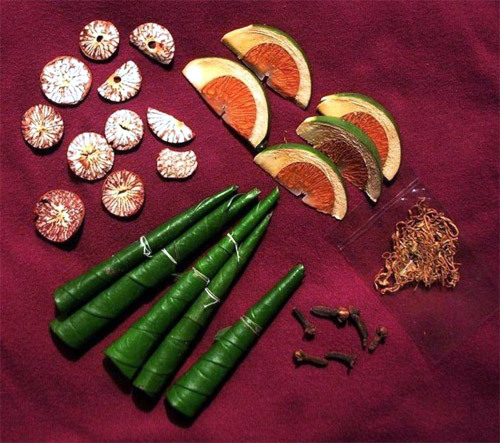 Image: A display of paan. The apex court's order for a health report was the opportunity which the anti-gutkha campaigners had been desperately hoping for. Bhavna Mukhopadhyay, the executive director of VHAI, and K Srinath Reddy, the president of PHFI, were among those who stepped up their advocacy campaigns with the government. The National Institute of Health & Family Welfare was preparing the report. On its panel of experts providing guidance and scientific proof of the havoc gutkha causes on a person's health was Chaturvedi, the cancer specialist. Having seen his patients, gutkha addicts, suffer and die of oral cancer, he had set up an organisation called Voice of Tobacco Victims in 2009. He had realised that rattling off statistics about the ill-effects of gutkha had no impact on policy-makers; but human agony moved everybody and almost assured action. So, he had started getting cancer patients to tell their story to bureaucrats and policy makers in Maharashtra - an exercise he would later take to the national level. 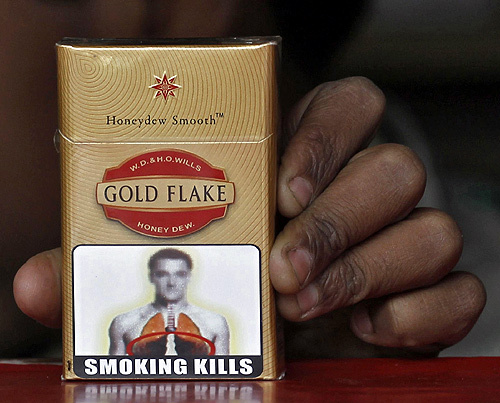 Image: A vendor holds a cigarette pack printed with a picture bearing likeness to Chelsea's soccer player John Terry at his roadside stall in New Delhi. The <I>gutkha</I> health report was finally submitted to the Supreme Court in February 2011. It was damning. Smokeless tobacco products, such as <I>gutkha</I> and khaini, it was found, have 3,095 chemical ingredients, of which 28 are proven carcinogens. It was time for action. The health ministry called for a national consultation on smokeless tobacco. Mukhopadhyay and members of PHFI were among the 80-odd tobacco control experts from across India who participated. Also present was Desiraju, who is the grandson of the country's second president, Sarvepalli Radha-krishnan. "We asked the ministry, if this is so toxic then how come there's no mention of this in the Food Safety and Standards Act," says Mukhopadhyay. "Restrictions and regulations aren't good enough. <I>gutkha</I> manufacturers always find ways around them," she says. A ban was the only solution. Economic implications of a total ban, loss of revenue and livelihood, all came under discussion. Image: Laxmi packs lime paste tubes outside her house in a slum area in Mumbai. On August 1, four months after this national consultation, a new rule was notified under central government's Food Safety and Standards Act (FSSA). It said: "tobacco and nicotine shall not be used as ingredients in any food product". This was that critical Central government order which gave the state governments the legal standing to act against <I>gutkha</I>. But it wasn't over yet. Dharampal Satyapal Group (DS Group), the Rs 2,200-crore conglomerate which manufactures and sells Baba and Tulsi brands of <I>gutkha</I>, and some others went to court. In December, the director of Food Safety and Standards Authority of India submitted a counter affidavit in court on the "allegations/averments made by the petitioners". Image: A man prepares chewing tobacco in Allahabad. Desiraju waited no more. The FSSA rules in hand, he acted immediately and this January onwards, started sending out letters to states he "thought would act". One such state was Madhya Pradesh. Its then food safety commissioner, Ashwini Kumar Rai, was waiting for something like this. He would have liked to crack down on <I>gutkha</I> earlier but decided to hold on just a few months before the licences of the 18 existing manufacturers expired on March 31. On April 1, not only did he issue the order banning the sale of <I>gutkha</I> and barring new licences to be given out for its manufacture, he also started the raids on Day One. "All 18 went out of business in one day," he says. He did not wait for the state cabinet to order the ban. Though the FSSA rules empower the food safety commissioner to take such action, in every other state, the ban has gone through the cabinet. "This is a politically sensitive issue," says Rai. "But my chief minister (Shivraj Singh Chouhan) was on board." 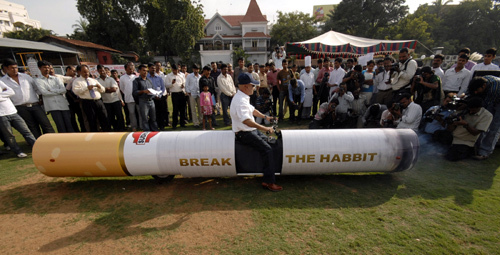 Image: Indian car designer K. Sudhakar drives a cigarette shaped motorcycle in Hyderabad. In less than two weeks, Rai had conducted over 1,000 raids in more than 50 districts. In four months, till July 25 when he became secretary (personnel), Rai had seized 4 million pouches of <I>gutkha</I> worth Rs 1 crore. "The trade has now gone underground," he says. "Pouches which were available for as little as Rs 1 now cost Rs 10." It's both good and bad. "Enforce-ment has become tougher. But then, <I>gutkha</I> is no longer easily available to women and children who would turn to it because they didn't have to fear the stigma of lighting up." 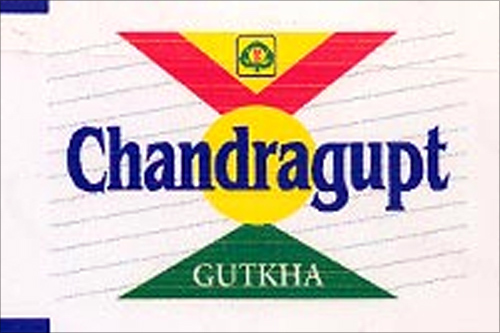 While Rai went after <I>gutkha</I> makers and sellers, Chaturvedi and VHAI took advocacy to the highest level. They held MLA sensitisation programmes in the state assemblies with the help of tobacco-related cancer victims and their families. "Six victims, including a widow and a 17-year-old boy who had lost his father to tobacco, told their stories to the chief minister and the MLAs in the Madhya Pradesh Assembly in March," says Chaturvedi. 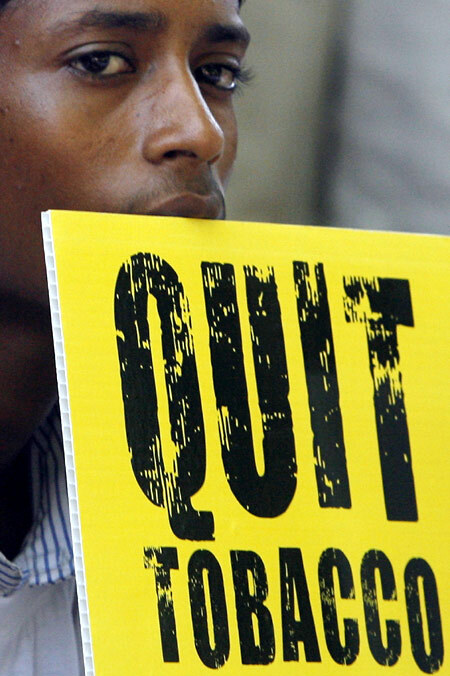 Image: A man holds placards during an anti-tobacco awareness campaign. Similar sessions were held in Chhattisgarh which banned gutkha, Maharashtra (banned both gutkha and paan masala and increased taxes on bidi - "a highly politically sensitive issue"), Bihar (ban) and Kerala (Chief Minister Oommen Chandy increased the no-tobacco zone around educational institutes from 100 yards to 400 metres). "In Jammu & Kashmir, a patient who had lost his voice and was speaking through the hole in his neck told the MLAs how this was a trade of death and destruction," says Chaturvedi. As a result, the state's food commissioner has ordered that random samples of gutkha and paan masala be tested for tobacco and/or nicotine. In Uttar Pradesh, where Chief Minister Akhilesh Yadav was not present, the session with cancer patients was held with the chief secretary and health, education and finance ministers. Uttar Pradesh has since scaled up VAT on gutkha four times. On a plea filed by the Uttar Pradesh chapter of the Indian Dental Association, the Allahabad High Court has served a show cause notice on the government asking it "why the FSSA regulation cannot be implemented in the state". In the health ministry, Desiraju has been writing to more and more states, mentioning in his letter the FSSA rules, the Supreme Court order which says gutkha is a food item, Madhya Pradesh's ban and the Allahabad High Court's direction on the Indian Dental Association's plea. With him in this is Amal Pushp, who took over as director of tobacco control in January. Between the two, they are responding to every query coming in from the states. "This is a central legislation," says Pushp. "The states don't have a choice but to act on it." "Why are they just targeting gutkha?" asks C K Sharma, the business head of DS Group's tobacco division. "There is clearly the cigarette lobby working here. An addict will not give up tobacco just like that. Freeze the gutkha supply and he will turn to cigarettes," he says. "And why target paan masala which is just dried paan with no tobacco?" he asks. Pushp says <I>gutkha</I> is just the beginning. "The ultimate aim," he says "is to reduce the consumption of all tobacco products." He has been participating in some sensitisation programmes against cigarettes as well. In July, he was in Bihar where officers of the rank of deputy superintendent of police have been nominated in districts as nodal officers of the task force to enforce the Cigarettes and Other Products Act - a regulatory act to control the consumption of cigarettes and other such products. The <I>gutkha</I> industry is, meanwhile, fighting the ban tooth and nail, going to court in practically every state where it's being targeted. But the Patna and Madhya Pradesh high courts have dismissed their petitions saying that the food safety commissioner has every authority to exercise the power to ban <I>gutkha</I>. "This time," says Pushp, "we are on strong footing." 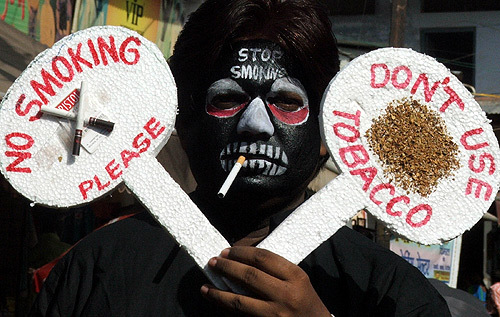 Image: A student holds a placard during an anti-tobacco awareness campaign on the eve of World No Tobacco Day in Mumbai.